3. Display - 6.3" in-cell LTPS display with an FHD+ resolution, brightness, contrast, color temperature, sRGB coverage, etc. 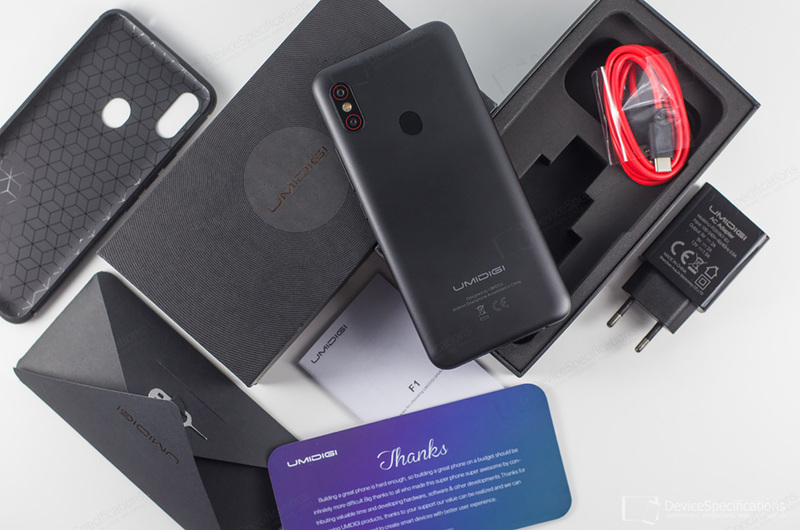 UMIDIGI F1 is the latest UMIDIGI smartphone which brings the company's best intentions to offer an affordable smartphone with very good performance, higher-than-average battery autonomy and good design. For the asking price of USD 220, you get all this and more. Be sure to check out all pages of this extensive UMIDIGI F1 review and see for yourself whether this smartphone covers your expectations. 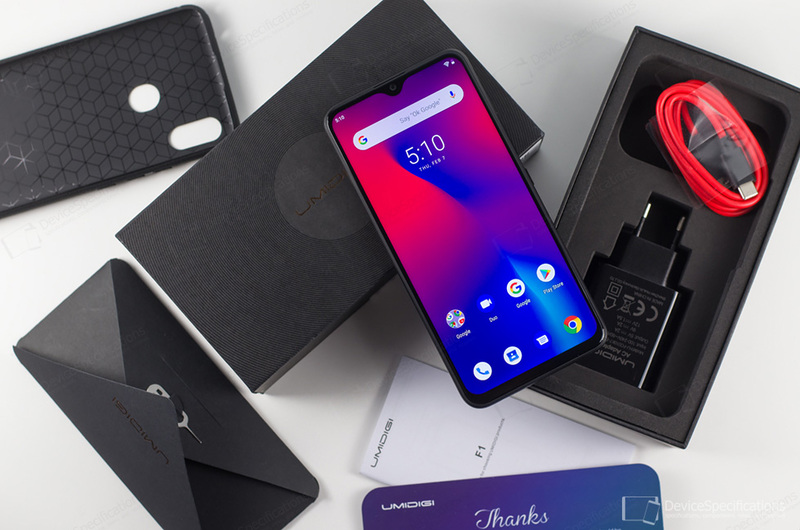 You can buy an UMIDIGI F1 from various stores such as the official UMIDIGI Store on AliExpress, the official store on Amazon DE or UMIDIGI's own online shop. UMIDIGI F1 is built around a 6.3-inch in-cell LTPS display with an FHD+ resolution (1080 x 2340 pixels) and a 19.5:9 aspect ratio. It takes up 83.85% of the total front surface of the handset that's covered with a 2.5D curved glass and has a waterdrop notch. The notch houses the 16MP Samsung S5K3P3 front shooter which is paired with a 5-element lens and supports face unlock. The rear camera module contains a 16MP Samsung S5K2P7 main shooter and an 8MP S5K4H7 auxiliary one. The main snapper is combined with a 6-element lens with an f/1.7 aperture and the second one is used when shooting in bokeh mode. The rear cameras are adjoined by a classic fingerprint sensor placed on the back of the handset. As long as it concerns performance, the model relies on a MediaTek Helio P60 (MT6771V) chipset. It features an octa-core CPU with all cores ticking at 2GHz. Four of them are Cortex-A73 and the other four are Cortex-A53 ones. The graphics department is managed by a tri-core Mali-G72 GPU clocked 800 MHz. There are 4GB of double-channel LPDDR4X RAM, clocked at 1800MHz on board as well as 128GB of eMMC 5.1 storage, expandable with up to 256GB. A 5150 mAh Li-Pol battery keeps the lights on. It supports MediaTek Pump Express Plus and arrives with an 18W fast charger. As long as it concerns connectivity, UMIDIGI F1 offers plenty of options. It supports fully-capable NFC (supports read/write, card emulation, and P2P), Bluetooth 4.1, dual-band Wi-Fi 802.11 a/b/g/n, Wi-Fi Direct, Wi-Fi Hotspot, Wi-Fi Display. In terms of satellite positioning, the model works with GPS, GLONASS, BeiDou. It arrives with a hybrid, dual Nano-SIM card slot and provides simultaneous dual 4G and VoLTE support. The handset supports the following network bands for both SIM cards: 2G GSM (Bands 2/3/5/8), 2.5G CDMA (1X/BC0/BC1), 3G WCDMA (1/2/4/5/6/8/19), 3G TD-SCDMA (34/39), 4G TDD-LTE (34/38/39/40/41) and 4G FDD-LTE (1/2/3/4/5/7/8/12/13/17/18/19/20/25/26/28A/28B). UMIDIGI F1 equipped with a USB Type-C 2.0 port and a 3.5 mm jack and runs on stock Android 9 Pie.